There aren't many people nowadays who don't have some sort of online connection. Heck, it's practically the only way now to communicate with family and friends who live all over the world! So to make wedding planning a bit easier and oh so chic, creating a stylish wedding website as your Hub of I Do Soon updates is a must. 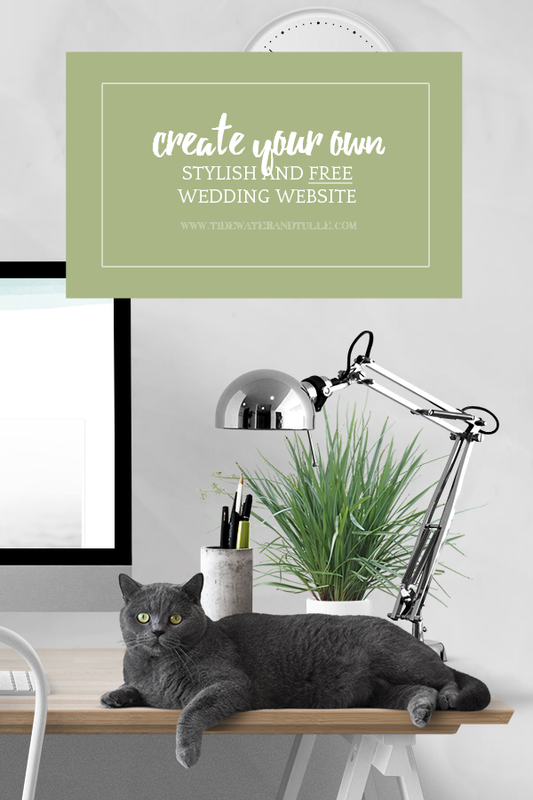 Thanks to Minted, we're sharing our top reasons on why you need to have a wedding website and then how to make a FREE website to take your wedding style to a digital level. Let's get clicking! No cookie cutter designs. Literally hundreds of customization features and styles to suit every couple. Way back in the early web days of '07, there was literally one kind of "winter wedding website" template. You know the one. Drifting snowflakes, dashes of red and green, kitschy festive font. All of none which fit my wedding vision of classic letterpress, natural pinecones and trees, and snow white at all. Thankfully, the internet grew up and became a beautiful swan of diversity because there are now amazing designs to accommodate all wedding dreams. Whether you're an urban mermaid or a whimsical woodland creature or an industrial hipster, you're going to find something that speaks to you. Did we mention free? Because yup. Most all wedding websites out there have a free version. We're partial to Minted's because they're gorgeously stylish, and they can match your wedding day stationery. For those who love coordinating everything, it's a win-win design situation. 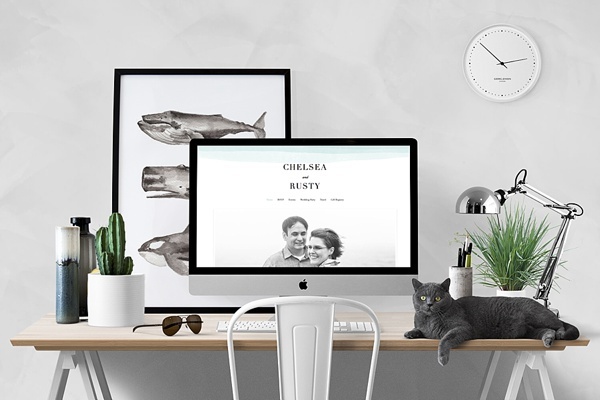 And if you want to take your free website to the next level on Minted, you can upgrade to get a custom URL (e.g., http://chelseaandrusty.minted.us) so it's not a tossed salad of numbers and letters on your save the dates. It helps you manage your RSVP list from anywhere. Left your planning binder at home and you just got a phone call about an invite? No prob! Log into your wedding website dashboard to make notes and update guest names. We all have those friends who are super night owls and wait to see the sunrise before going to bed or, the opposite, those family members who think 5:00am is sleeping in. The beauty of online websites is that they are accessible no matter time of day, and guests don't need to wait for you to be available to find out the scoop. Easy linking to your registries. Invited guests who aren't able to attend your wedding shower or the wedding day due to distance and still want to gift you a congrats can quickly find where you're registered without spoiling the surprise by emailing you. It also tries to help take away any awkwardness with asking or trying to find out who already gave what! You don't need to be a website designer to have one. Since you don't have to know confusing code and where to host a website, it's so easy to take advantage of all the places that take care of that for you! Minted did the heavy lifting to make stuff functional and pretty for you so all you have to do is plug in your information and share your love story with the world. Fact: Anything that gives me more time to do other stuff is my best friend for life. We have created a complete walk-through video to show you how easy it is to setup a free wedding website with Minted. Take a peek below or head over to Tidewater and Tulle's YouTube channel. You can literally build your own website in less than 5 minutes... at least the bones of it! There are so many directions you can take with your wedding website, but there are a few key tips to follow to make sure it's the most effective for your guests across all generations. Just like on your invitation, be specific about times and dress code; this will help alleviate any concerns leading up to the day. Ask your guests if they have food allergies or dietary restrictions. To show you are thinking ahead and care that all of your guests are having a great time, you will comfort many people who typically don't get to enjoy food at large events. Share room block information on your accommodations page to let your guests know there is special pricing at your preferred hotels. And most of all, make it personal. Share your story, celebrate your engagement, introduce your life's VIPs to everyone. The wedding planning period is a very exciting time, and it's up to you both on how you enjoy it! P.S. Love that watercolor whale poster in our photos like we do? That's Minted, too! You can find that print in their Fine Art section. Many thanks to Minted for partnering with Tidewater and Tulle for this DIY walk-through and video! And while the disclaimer is that I was sponsored through compensation to design this, the words and my loyal love for the brand are all my own. Some of the above product links are affiliate-linked and purchasing through these links helps support our wonderful sponsors and Tidewater and Tulle! You can find our full affiliate disclosure policy here.